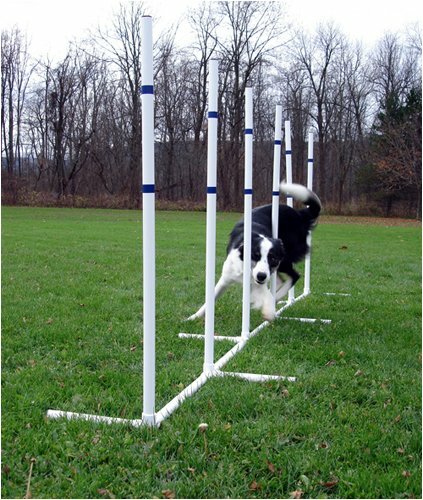 The Agility in a Bag set is the perfect solution for everyone just starting off in the fun sport of dog agility. Practice at home, or take it on the road. Everything you need in convenient carrying bags! Comes with 5 popular agility obstacles that can be used indoors or out. Made of furniture grade UV stabilized plastic. Weighs only 18 lbs. Includes: (1) WEAVE POLE SET: 6 pole set with free standing base. (2) HURDLE JUMP: The jump bar adjusts in height by sliding jump cups up and down on side bars. 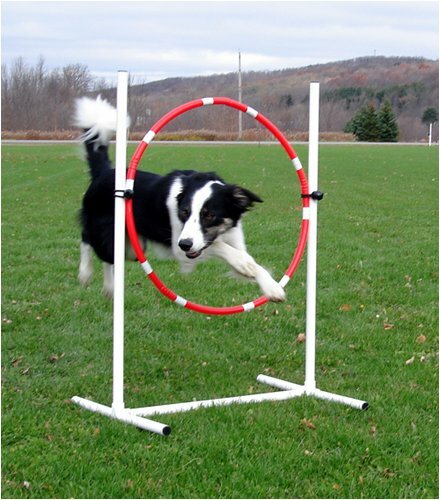 (3) TIRE JUMP: 22" diameter hoop slides up and down on side bars for adjusting for any size dog. (4) PAUSE BOX: Great training aid and substitute for the pause table. (5) TUNNEL Dacron canvas type 3' tunnel with 22" diameter. Use the tunnel by itself, or attach the chute. (6) CHUTE: Attachable 8' chute. Attaches with velcro. (7) CARRYING BAG: Sturdy canvas bag with zipper closure and extra wide strap. (8) ALSO INCLUDES: Colored vinyl tape for decorating poles and easy assembly and training tips. (Colors may vary from what is pictured). Our most popular item!